It is hard to believe that it is almost one year ago, Memorial Day 2013, that I had my home visit from Guide Dogs for the Blind. I was so nervous then. It was an important step and my aim was to impress on them that I was a good candidate for their training program. The day came hot and although we started early, my visitor arrived at 9 am on the dot, and we were out and about by 10 am, it was exhausting mentally. I had to show her a regular route that I walked and along the way she made reccommendations as to the suitability of the route for a guide dog. The walk to my workplace took about forty minutes with regular stops for me to give explanations for my route choice and for her to give me feedback. The route home was all Juno work. 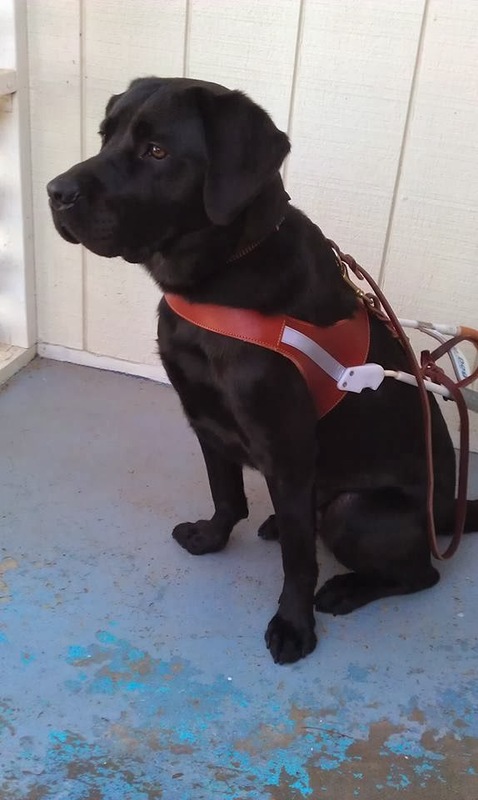 "Juno" is the name given to the training harness used by students. The instructor pretends to be a dog in harness and asks the student to follow, and consider corrections and encouragement of a real guide, so you get to feed the invisible dog and talk to it too. That portion of the morning took aboutt an hour as the instructor assessed my direction finding abillities, even leading me around the local Taco Bell parking lot in circles to see whether I could maintain a sense of direction. This may seem silly but you soon find when working with a dog, a sense of direction is a must have quality. If your dog leads you around an obstacle you may have done several ninety degree turns in no time and if you can't tell your original direction of travel you can quickly become very lost. Well after all that. The visitor told me she was reccomending me for training. A month later I received my invitation for a start date in October. All those weeks were blogged in my "... Days to Dog Day" series. 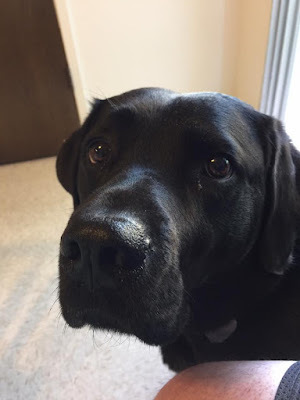 Now over six months have passed since graduation and I have a great guide in Leif my two year old black Labrador Retriever. Sits in his Guide Dogs for the Blind Harness.